it’s largest capacity screen, the 512 seater No.1. 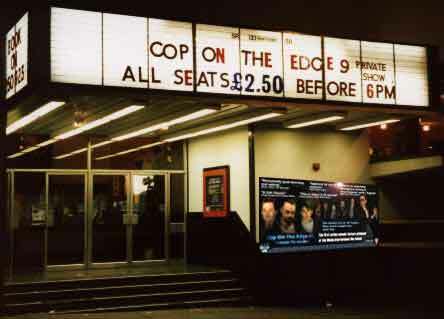 This cinema no longer exists in Newport, and is now a hotel. 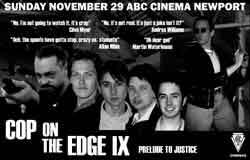 Sunday the 29th November 1998 at 1pm saw the world premiere of Cop on the Edge IX: Prelude to Justice on Wales’ largest cinema screen. 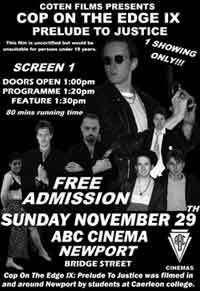 Over 200 people piled into the ABC Cinema in Newport to witness the event on a giant 40ft screen. The response was overwhelming, both BBC and HTV news teams were there to cover the première. At last a movie that knows what it’s all about, well, everyone seemed to enjoy it at least! 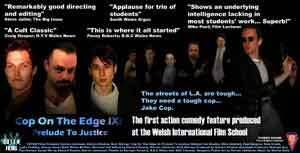 This is the screening leaflet that invaded every square inch of both Newport and Cardiff in the run up to the film. Literally thousands of these were plastered, posted and handed out to unwilling participants. Even 8 months later in the September of 1999 some of these flyers remained pasted to walls in Cardiff (yet alas they were removed in the run up to the rugby world cup). The advertising campaign stretched from two television news reports on BBC and HTV, radio, teletext, newspapers and the obvious fly postering (illegal apparently). Despite this blanket coverage only one lecturer from the film school turned up (on an experimental film course they do hate their seventy-five minute action movies). The acting was waverly at best, the plot transparent, the action fragmented, the effects non effective and the dialogue, oh the dialogue, the less said about that the better. Yet somehow, all this seemed to come together in just the right proportions to create something that had genuine charm, humour, and dare I say it, potential. 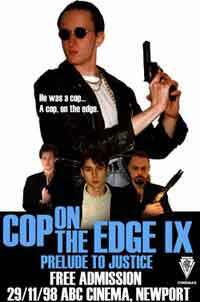 (although through all this it was still far superior to any Danny Cannon movie, anyone who has seen Judge Dredd or I still know what you did last summer knows exactly what I’m talking about) Indeed there is enough in ‘Cop’ to show that had a script been written more than 15 minutes before shooting (sometimes less) then a pretty damn good movie could have evolved, and next time will. If you compare ‘Cop’ to other directors self financed first films (Robert Rodriguez’ – El Mariachi, or Peter Jackson’s – Bad Taste), then it doesn’t do too badly at all, certainly as enjoyable as any, and with a character named ‘Jake Cop’ how could you possibly resist? 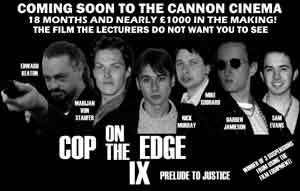 The original advance poster for ‘Cop’ that caused something of a stir around the college some 3 months before the film’s premiere. Many people, lecturers and students alike, were not quite sure whether this was real or not. I mean, who makes a feature film on a degree course? The follow up poster came complete with the official opening date, and coupled with the screening of the film’s trailer during cinema classes, convinced doubters that the film was in fact genuine, and scared the hell out of lecturers who had hoped against hope to the contrary. This poster was commissioned by the college to show future generations of students what can be achieved through hard work, perseverance, and a lack of anything productive to do with your free time. It will eventually hang proudly in the college main entrance at it’s Caerleon campus, as soon as principal Ken Overshott gets round to putting it up. A standee to promote the film. Many of these went walkabout due to their obvious collectability, or maybe their obvious throw darts at ability, who can say? This little baby stands at an impressive 8 inches in height. We go into more depth about these posters and advertising stunts in the Post-Production section of the site, under poster artwork.